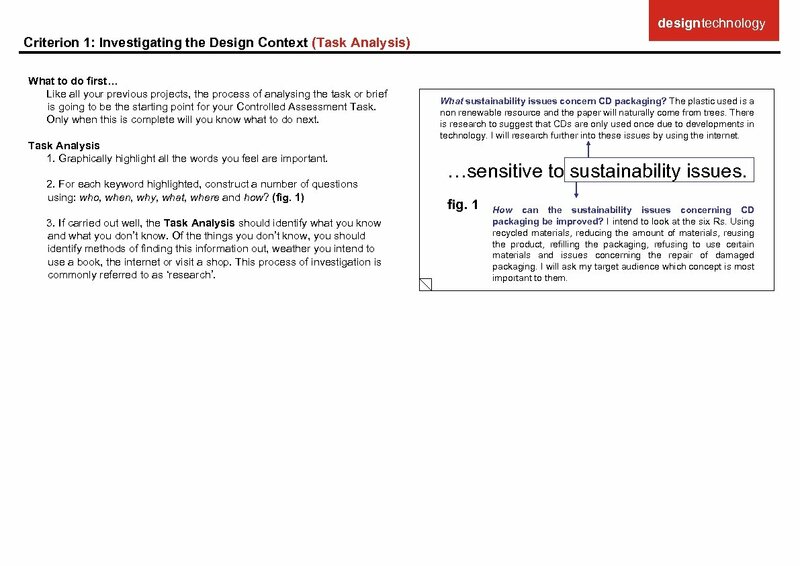 designtechnology Criterion 1: Investigating the Design Context (Task Analysis) What to do first… Like all your previous projects, the process of analysing the task or brief is going to be the starting point for your Controlled Assessment Task. Only when this is complete will you know what to do next. Task Analysis 1. Graphically highlight all the words you feel are important. 2. For each keyword highlighted, construct a number of questions using: who, when, why, what, where and how? (fig. 1) 3. If carried out well, the Task Analysis should identify what you know and what you don’t know. Of the things you don’t know, you should identify methods of finding this information out, weather you intend to use a book, the internet or visit a shop. This process of investigation is commonly referred to as ‘research’. 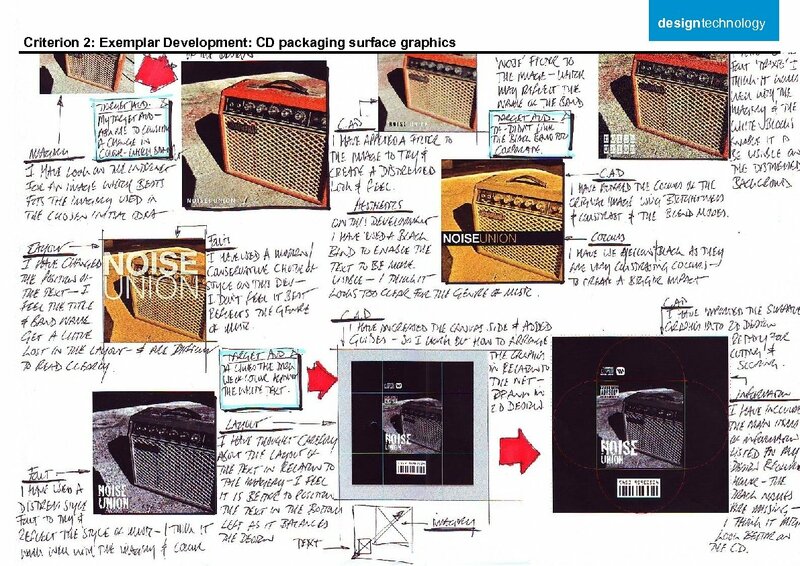 What sustainability issues concern CD packaging? The plastic used is a non renewable resource and the paper will naturally come from trees. There is research to suggest that CDs are only used once due to developments in technology. I will research further into these issues by using the internet. …sensitive to sustainability issues. fig. 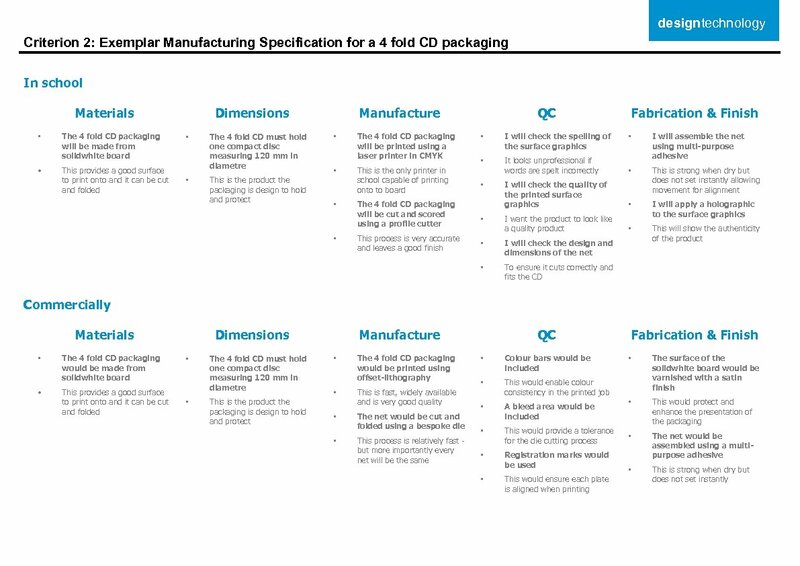 1 How can the sustainability issues concerning CD packaging be improved? I intend to look at the six Rs. Using recycled materials, reducing the amount of materials, reusing the product, refilling the packaging, refusing to use certain materials and issues concerning the repair of damaged packaging. I will ask my target audience which concept is most important to them. 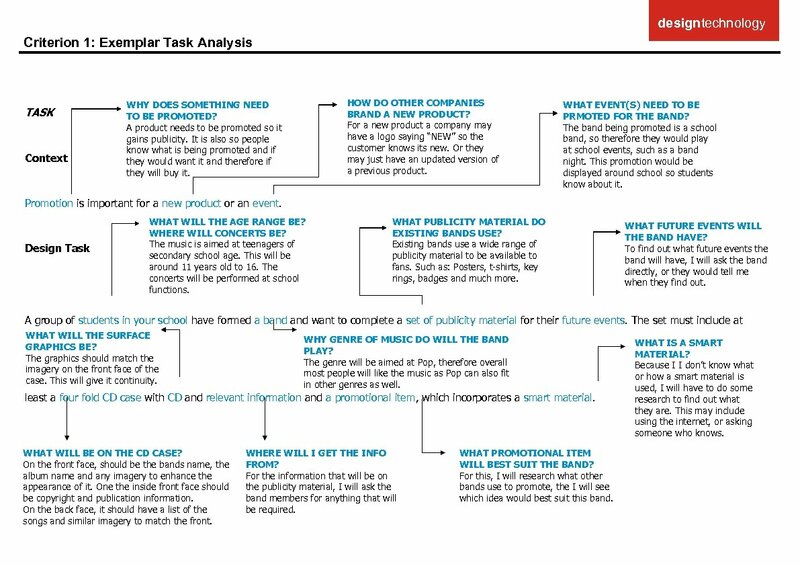 designtechnology Criterion 1: Exemplar Task Analysis TASK Context HOW DO OTHER COMPANIES BRAND A NEW PRODUCT? For a new product a company may have a logo saying “NEW” so the customer knows its new. Or they may just have an updated version of a previous product. WHY DOES SOMETHING NEED TO BE PROMOTED? A product needs to be promoted so it gains publicity. It is also so people know what is being promoted and if they would want it and therefore if they will buy it. WHAT EVENT(S) NEED TO BE PRMOTED FOR THE BAND? The band being promoted is a school band, so therefore they would play at school events, such as a band night. This promotion would be displayed around school so students know about it. Promotion is important for a new product or an event. Design Task WHAT WILL THE AGE RANGE BE? WHERE WILL CONCERTS BE? The music is aimed at teenagers of secondary school age. This will be around 11 years old to 16. The concerts will be performed at school functions. 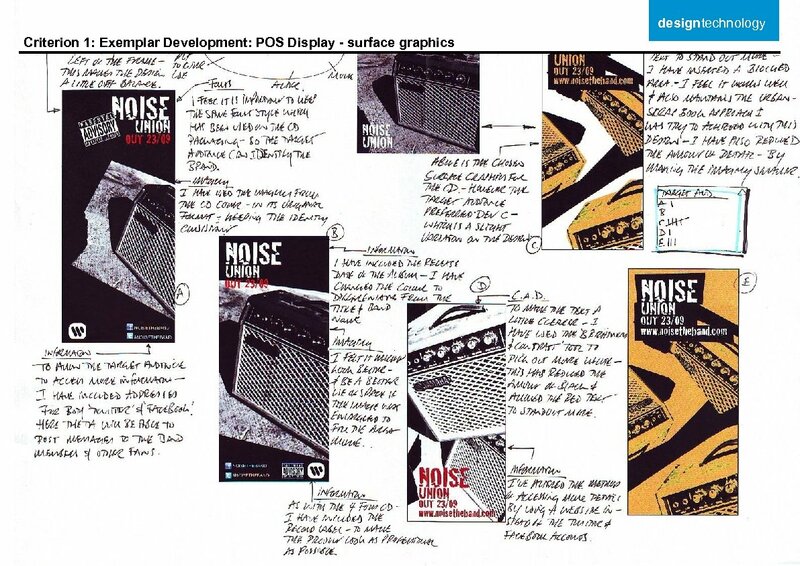 WHAT PUBLICITY MATERIAL DO EXISTING BANDS USE? Existing bands use a wide range of publicity material to be available to fans. Such as: Posters, t-shirts, key rings, badges and much more. WHAT FUTURE EVENTS WILL THE BAND HAVE? To find out what future events the band will have, I will ask the band directly, or they would tell me when they find out. A group of students in your school have formed a band want to complete a set of publicity material for their future events. The set must include at WHAT WILL THE SURFACE GRAPHICS BE? The graphics should match the imagery on the front face of the case. This will give it continuity. WHY GENRE OF MUSIC DO WILL THE BAND PLAY? The genre will be aimed at Pop, therefore overall most people will like the music as Pop can also fit in other genres as well. least a four fold CD case with CD and relevant information and a promotional item, which incorporates a smart material. WHAT WILL BE ON THE CD CASE? On the front face, should be the bands name, the album name and any imagery to enhance the appearance of it. One the inside front face should be copyright and publication information. On the back face, it should have a list of the songs and similar imagery to match the front. WHERE WILL I GET THE INFO FROM? For the information that will be on the publicity material, I will ask the band members for anything that will be required. WHAT PROMOTIONAL ITEM WILL BEST SUIT THE BAND? For this, I will research what other bands use to promote, the I will see which idea would best suit this band. WHAT IS A SMART MATERIAL? Because I I don’t know what or how a smart material is used, I will have to do some research to find out what they are. This may include using the internet, or asking someone who knows. CORPORATE TITLE HERE TASK 1 Context Environmental issues are becoming more and more important in our throw away society. Companies are taxed on the waste that they produce that is not recycled. 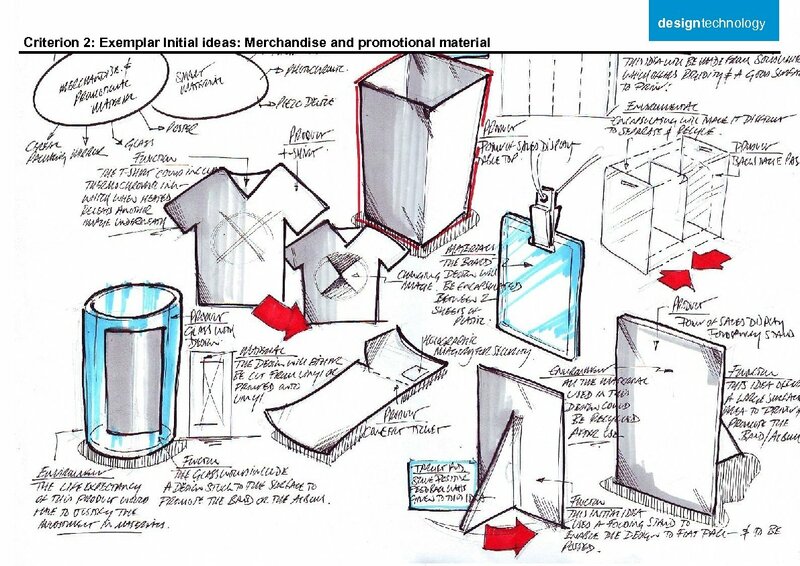 Design Task ‘RECYCLAPHONE’ a company who are environmentally aware and specialise in recycling and marketing mobile phones need to promote their product. 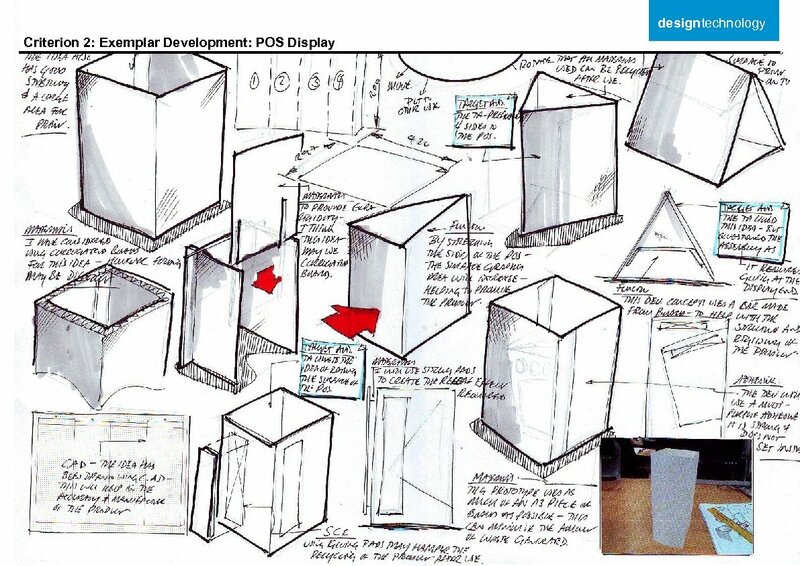 Design, prototype and packaging a block foam mobile phone. The phone must be packaged for its safety and security and be presented with promotional material ready for launch to the public. TASK 2 Context Promotion is important for a new product or an event. Design Task A group of students in your school have formed a band want to complete a set of publicity material for their future events. The set must include at least a four fold CD case with CD and relevant information and an item, which incorporates a smart material. TASK 3 Context Books that contain movement are now found in most book stores. They can be a source of pleasure to the readers. 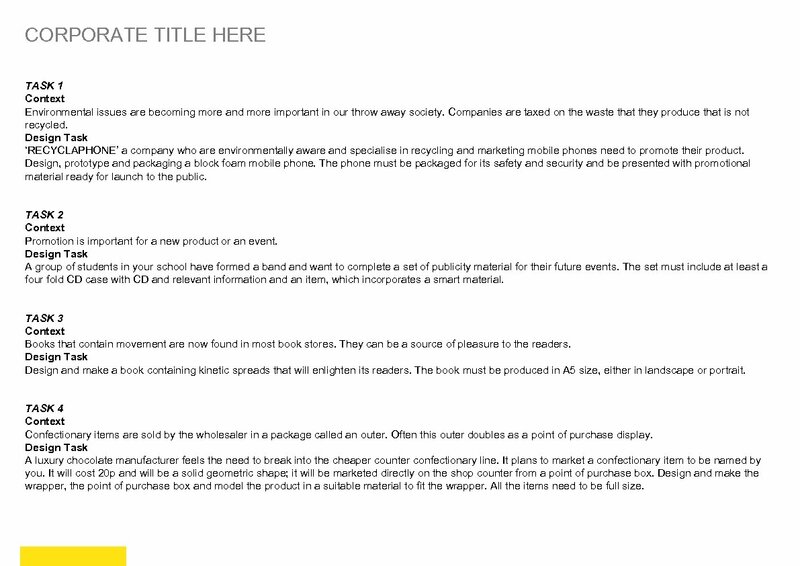 Design Task Design and make a book containing kinetic spreads that will enlighten its readers. The book must be produced in A 5 size, either in landscape or portrait. TASK 4 Context Confectionary items are sold by the wholesaler in a package called an outer. Often this outer doubles as a point of purchase display. Design Task A luxury chocolate manufacturer feels the need to break into the cheaper counter confectionary line. It plans to market a confectionary item to be named by you. It will cost 20 p and will be a solid geometric shape; it will be marketed directly on the shop counter from a point of purchase box. Design and make the wrapper, the point of purchase box and model the product in a suitable material to fit the wrapper. All the items need to be full size. 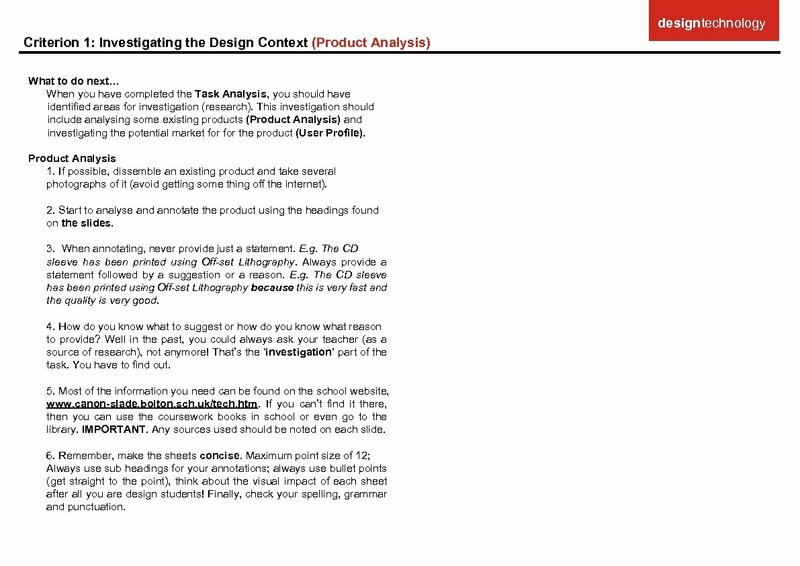 designtechnology Criterion 1: Investigating the Design Context (Product Analysis) What to do next… When you have completed the Task Analysis, you should have identified areas for investigation (research). This investigation should include analysing some existing products (Product Analysis) and investigating the potential market for the product (User Profile). Product Analysis 1. If possible, dissemble an existing product and take several photographs of it (avoid getting some thing off the internet). 2. 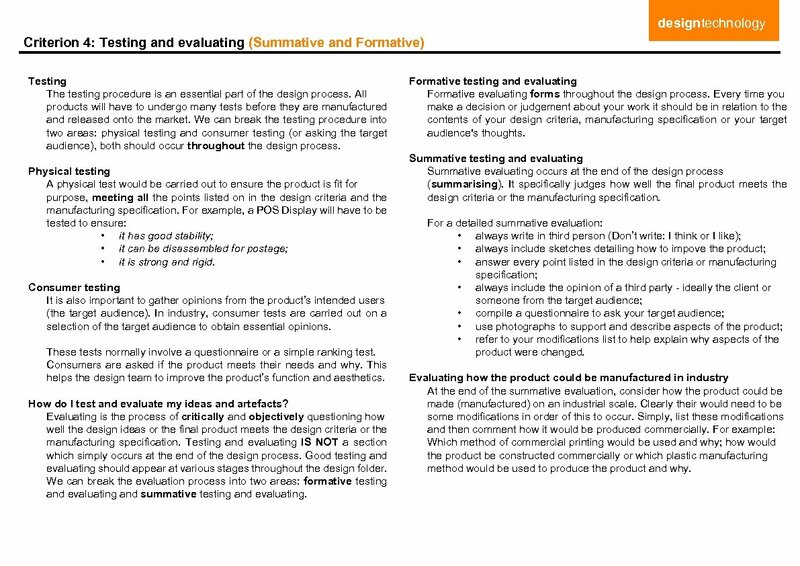 Start to analyse and annotate the product using the headings found on the slides. 3. When annotating, never provide just a statement. E. g. The CD sleeve has been printed using Off-set Lithography. Always provide a statement followed by a suggestion or a reason. E. g. The CD sleeve has been printed using Off-set Lithography because this is very fast and the quality is very good. 4. How do you know what to suggest or how do you know what reason to provide? Well in the past, you could always ask your teacher (as a source of research), not anymore! That’s the ‘investigation’ part of the task. You have to find out. 5. Most of the information you need can be found on the school website, www. canon-slade. bolton. sch. uk/tech. htm. If you can’t find it there, then you can use the coursework books in school or even go to the library. IMPORTANT. Any sources used should be noted on each slide. 6. Remember, make the sheets concise. Maximum point size of 12; Always use sub headings for your annotations; always use bullet points (get straight to the point), think about the visual impact of each sheet after all you are design students! Finally, check your spelling, grammar and punctuation. 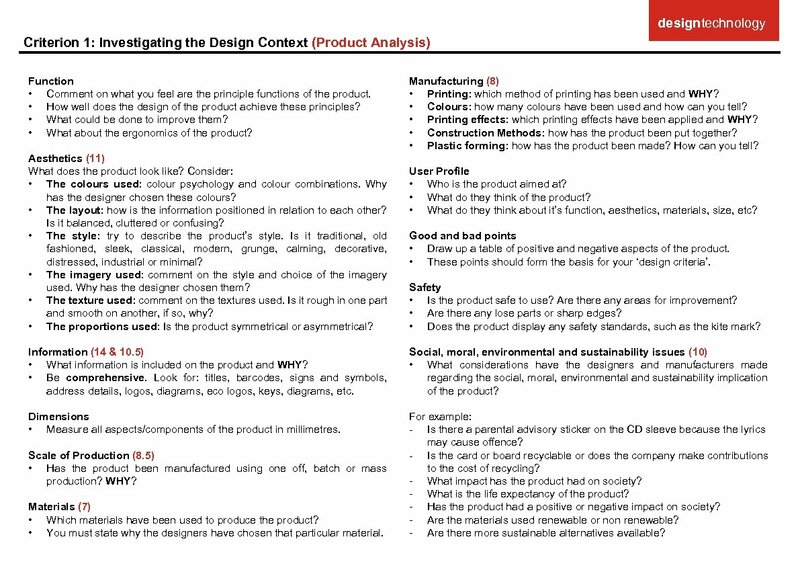 designtechnology Criterion 1: Investigating the Design Context (Product Analysis) Function • Comment on what you feel are the principle functions of the product. • How well does the design of the product achieve these principles? • What could be done to improve them? • What about the ergonomics of the product? Aesthetics (11) What does the product look like? Consider: • The colours used: colour psychology and colour combinations. Why has the designer chosen these colours? 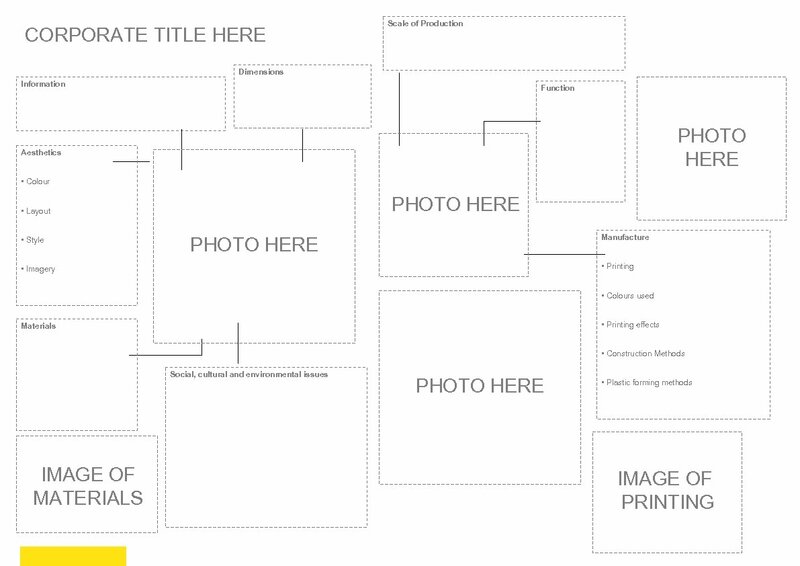 • The layout: how is the information positioned in relation to each other? Is it balanced, cluttered or confusing? • The style: try to describe the product’s style. Is it traditional, old fashioned, sleek, classical, modern, grunge, calming, decorative, distressed, industrial or minimal? • The imagery used: comment on the style and choice of the imagery used. Why has the designer chosen them? • The texture used: comment on the textures used. Is it rough in one part and smooth on another, if so, why? • The proportions used: Is the product symmetrical or asymmetrical? Manufacturing (8) • Printing: which method of printing has been used and WHY? • Colours: how many colours have been used and how can you tell? • Printing effects: which printing effects have been applied and WHY? • Construction Methods: how has the product been put together? • Plastic forming: how has the product been made? How can you tell?  User Profile • Who is the product aimed at? • What do they think of the product? • What do they think about it’s function, aesthetics, materials, size, etc? Good and bad points • Draw up a table of positive and negative aspects of the product. 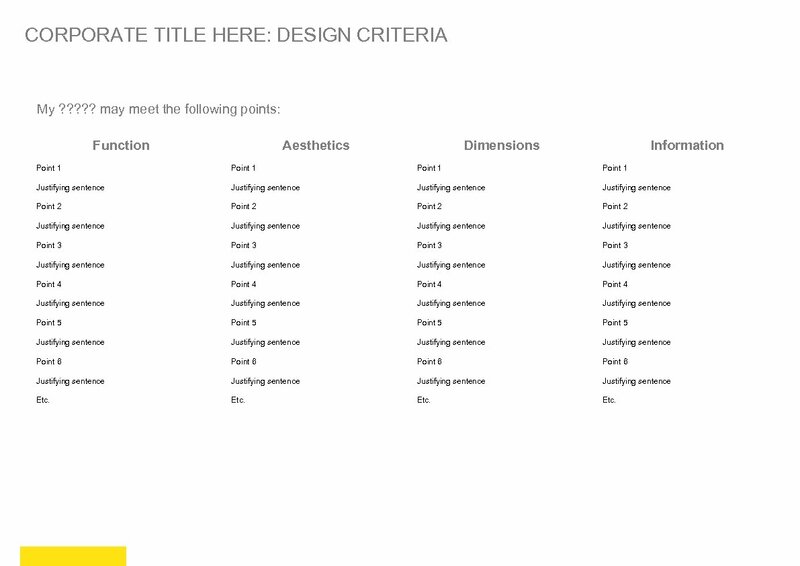 • These points should form the basis for your ‘design criteria’. Safety • Is the product safe to use? Are there any areas for improvement? • Are there any lose parts or sharp edges? • Does the product display any safety standards, such as the kite mark? Information (14 & 10. 5) • What information is included on the product and WHY? • Be comprehensive. Look for: titles, barcodes, signs and symbols, address details, logos, diagrams, eco logos, keys, diagrams, etc. Social, moral, environmental and sustainability issues (10) • What considerations have the designers and manufacturers made regarding the social, moral, environmental and sustainability implication of the product? Dimensions • Measure all aspects/components of the product in millimetres. For example: - Is there a parental advisory sticker on the CD sleeve because the lyrics may cause offence? - Is the card or board recyclable or does the company make contributions to the cost of recycling? - What impact has the product had on society? - What is the life expectancy of the product? - Has the product had a positive or negative impact on society? - Are the materials used renewable or non renewable? - Are there more sustainable alternatives available? Scale of Production (8. 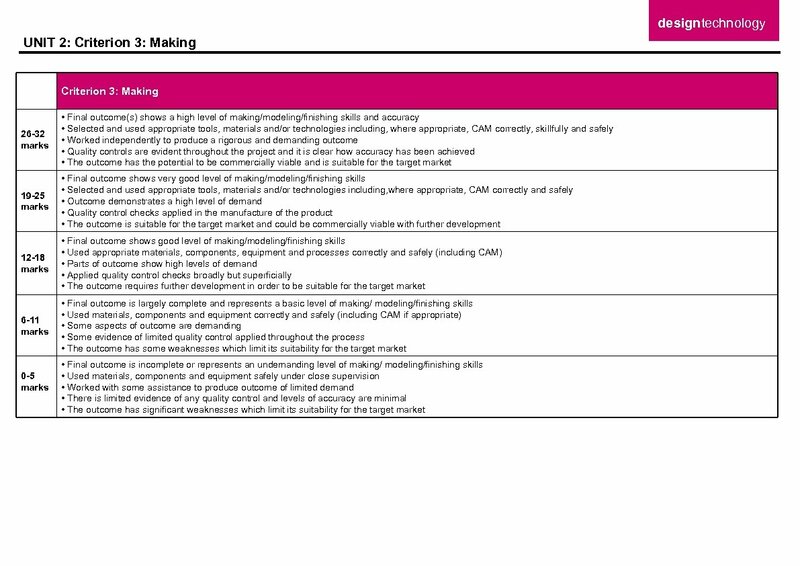 5) • Has the product been manufactured using one off, batch or mass production? WHY? Materials (7) • Which materials have been used to produce the product? • You must state why the designers have chosen that particular material. 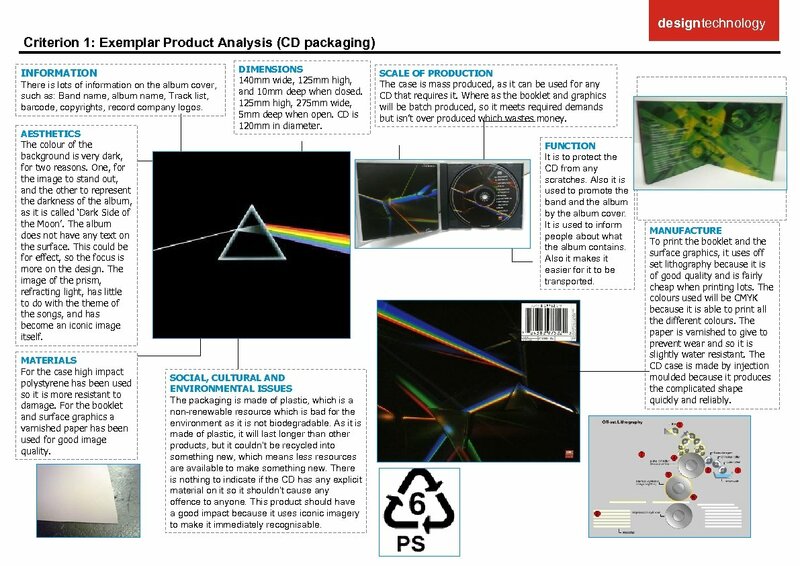 designtechnology Criterion 1: Exemplar Product Analysis (CD packaging) INFORMATION There is lots of information on the album cover, such as: Band name, album name, Track list, barcode, copyrights, record company logos. AESTHETICS The colours used on the album are very bright and vibrant which are attractive to the customer but also reflects the 1960’s theme. The layout of the text is central to be in focus, however the image fills most of the front. The style is revolved around the iconic image from the 60’s but renewed to make it look modern. The image taken from 1967 was first designed by Peter Blake. MATERIALS The material used to create this product would be solid white board. They would use this because it is a strong card which is bleached on both sides which is good for printing onto. DIMENSIONS 140 mm wide, 125 mm high, 8 mm deep when folded. 427 mm wide, 125 mm high, 2 mm deep when open. The CD has a diameter of 120 mm. SOCIAL, CULTURAL AND ENVIRONMENTAL ISSUES The packaging is made of card, which is a sustainable resource which is much better than using a plastic CD case. As it is made of card, it won’t last as long as other products, but it could be recycled into something new, which means less resources are needed to make something new. There is nothing to indicate if the CD has any explicit material on it so it shouldn’t cause any offence to anyone. This product should have a good impact because it is a well know product already, but it just looks modern and much more attractive. SCALE OF PRODUCTION The production of this product would be batch produced because the product will be popular and it needs to be able to meet demands, but will not need to be mass produced because it won’t be sold continuously. FUNCTION It is to protect the CD from any scratches. Also it is used to promote the band the album by the album cover. It is used to inform people about what the album contains. Also it makes it easier for it to be transported. MANUFACTURE This product uses offset lithography. This is because the process is fast and is very good quality. This is the most cost effective printing method for mass production. It uses five colours, CMYK for the images and for the main red colour, they use a spot colour, so it is the same colour on every product. To make it look glossy, a laminate layer has been added. To construct this a net has been die cut out and then glued together. 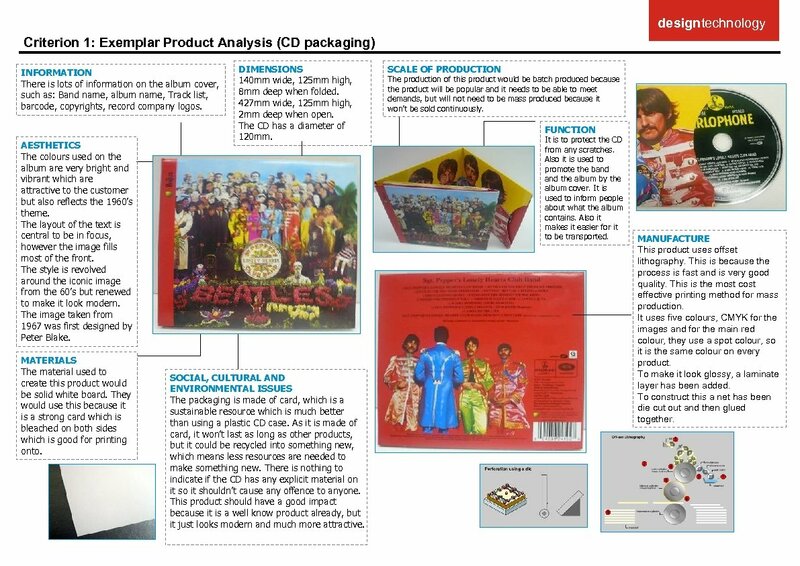 designtechnology Criterion 1: Exemplar Product Analysis (CD packaging) INFORMATION There is lots of information on the album cover, such as: Band name, album name, Track list, barcode, copyrights, record company logos. AESTHETICS The colour of the background is very dark, for two reasons. One, for the image to stand out, and the other to represent the darkness of the album, as it is called ‘Dark Side of the Moon’. The album does not have any text on the surface. This could be for effect, so the focus is more on the design. The image of the prism, refracting light, has little to do with theme of the songs, and has become an iconic image itself. MATERIALS For the case high impact polystyrene has been used so it is more resistant to damage. For the booklet and surface graphics a varnished paper has been used for good image quality. DIMENSIONS 140 mm wide, 125 mm high, and 10 mm deep when closed. 125 mm high, 275 mm wide, 5 mm deep when open. CD is 120 mm in diameter. SCALE OF PRODUCTION The case is mass produced, as it can be used for any CD that requires it. Where as the booklet and graphics will be batch produced, so it meets required demands but isn’t over produced which wastes money. FUNCTION It is to protect the CD from any scratches. Also it is used to promote the band the album by the album cover. It is used to inform people about what the album contains. Also it makes it easier for it to be transported. SOCIAL, CULTURAL AND ENVIRONMENTAL ISSUES The packaging is made of plastic, which is a non-renewable resource which is bad for the environment as it is not biodegradable. As it is made of plastic, it will last longer than other products, but it couldn’t be recycled into something new, which means less resources are available to make something new. There is nothing to indicate if the CD has any explicit material on it so it shouldn’t cause any offence to anyone. This product should have a good impact because it uses iconic imagery to make it immediately recognisable. PHOTO HERE MANUFACTURE To print the booklet and the surface graphics, it uses off set lithography because it is of good quality and is fairly cheap when printing lots. The colours used will be CMYK because it is able to print all the different colours. The paper is varnished to give to prevent wear and so it is slightly water resistant. 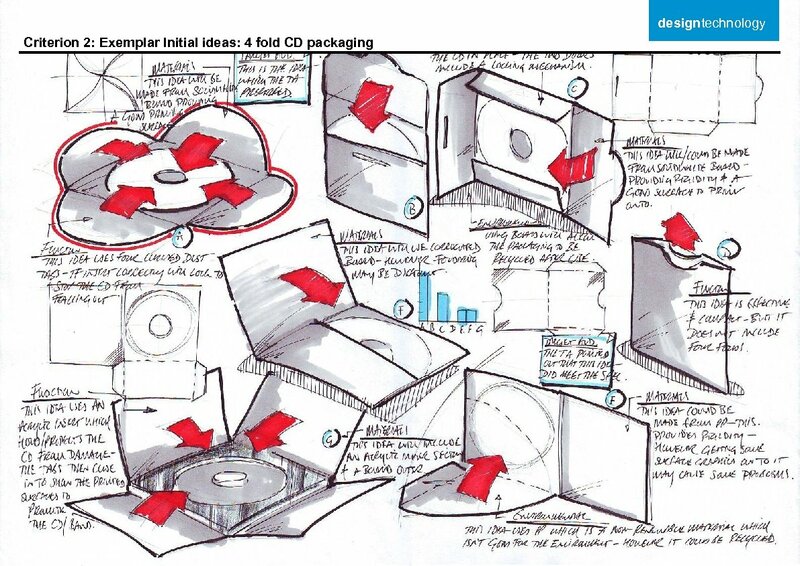 The CD case is made by injection moulded because it produces the complicated shape quickly and reliably. 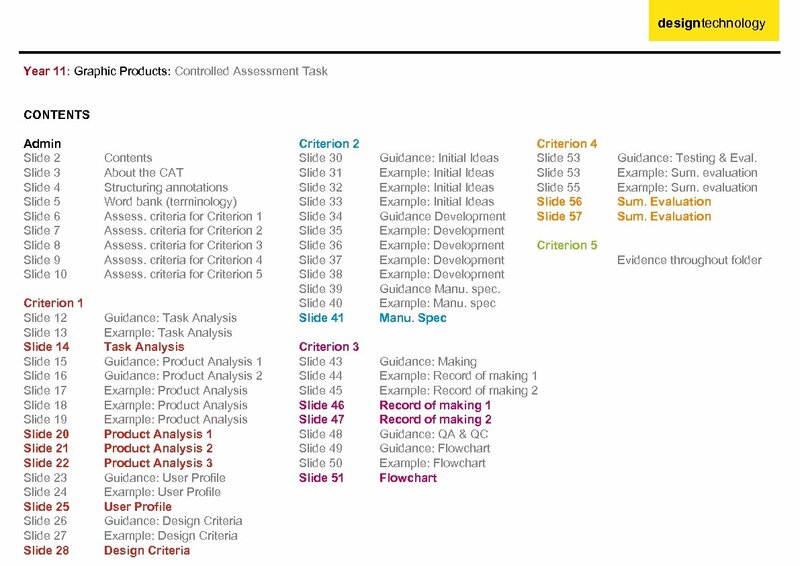 designtechnology Criterion 1: Exemplar Product Analysis (POS display) INFORMATION On the lower section, are two faces with information on. On one side it shows the dates and times of the shows and the website for more information. On the other side is the location of the shows and what they are featuring. DIMENSIONS When standing, it measures 210 mm tall, 125 mm wide and 105 mm deep. When folded away, it is 155 mm tall, 125 mm wide and about 2 mm deep. AESTHETICS The design of this product is kept very minimal and simplistic. This gives it a modern and formal style. The complex design which incorporates the title of the exhibition, is used to prove that the University if Salford has the facilities to produce this sort of design. The colour of the text is a metallic pantone to contrast with the deep blue background colour. This also make the style very modern and formal. MATERIALS The material used for this is a textured blue board. They have used this board mainly because it is strong and can cope with the complex design. SCALE OF PRODUCTION For this product, it will have been batch produced. This is because it is a complex design and will have to be manually watched whilst machined, but enough are produced to meet requirement. FUNCTION The main purpose of this product is to inform what the show is about an when it is. It is also for promoting, by using a complex design which shows off the ability the University has. MANUFACTURE For the main body of this display, it is most likely to have been laser cut because the design is too complicated for it to be manually cut out and would be time consuming. The laser cutter is much more precise, faster and the design can be repeated. For the information, it is a spot colour which has either been screen printed on, or they have used off set lithography if they are producing lots of them. SOCIAL, CULTURAL AND ENVIRONMENTAL ISSUES This product has been made out of card which is a renewable source and doesn’t damage the environment as it can be recycled. It shouldn’t offend anyone because it doesn’t show any specific offensive material. The purpose of this product is to attract people to the show so artists and designers can show there work to the people in the local area. This creates a social event for people to go to. 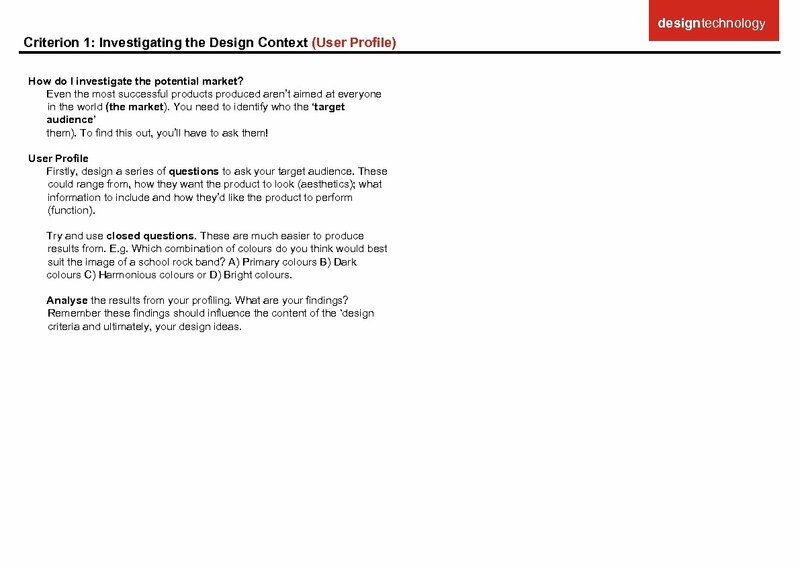 designtechnology Criterion 1: Investigating the Design Context (User Profile) How do I investigate the potential market? Even the most successful products produced aren’t aimed at everyone in the world (the market). You need to identify who the ‘target audience’ them). To find this out, you’ll have to ask them! 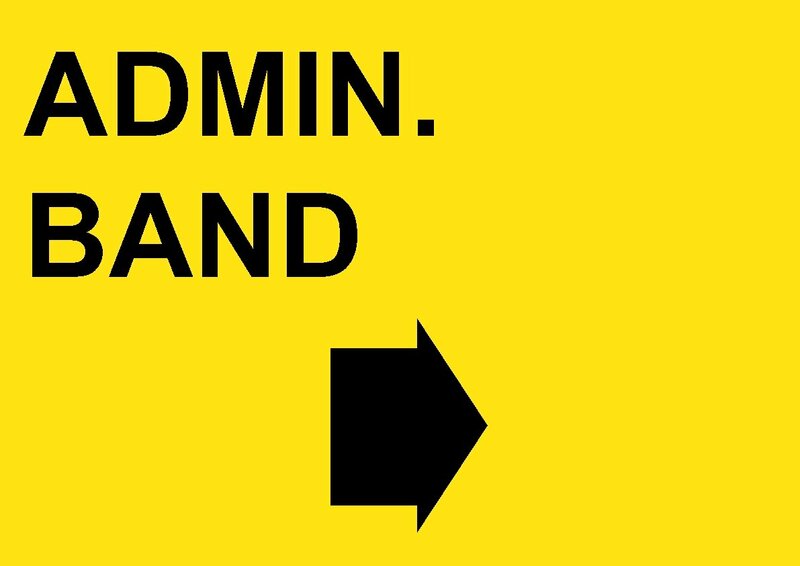 User Profile Firstly, design a series of questions to ask your target audience. These could range from, how they want the product to look (aesthetics); what information to include and how they’d like the product to perform (function). Try and use closed questions. These are much easier to produce results from. E. g. Which combination of colours do you think would best suit the image of a school rock band? A) Primary colours B) Dark colours C) Harmonious colours or D) Bright colours. Analyse the results from your profiling. What are your findings? 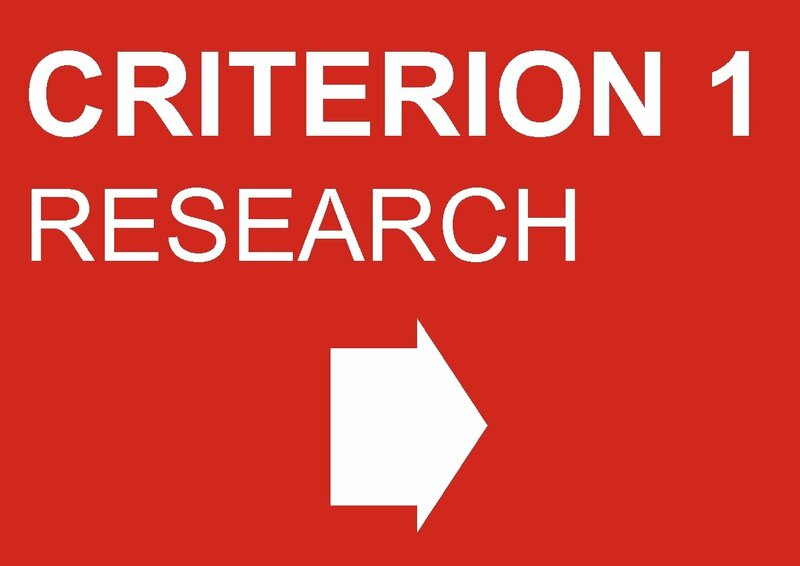 Remember these findings should influence the content of the ‘design criteria and ultimately, your design ideas. 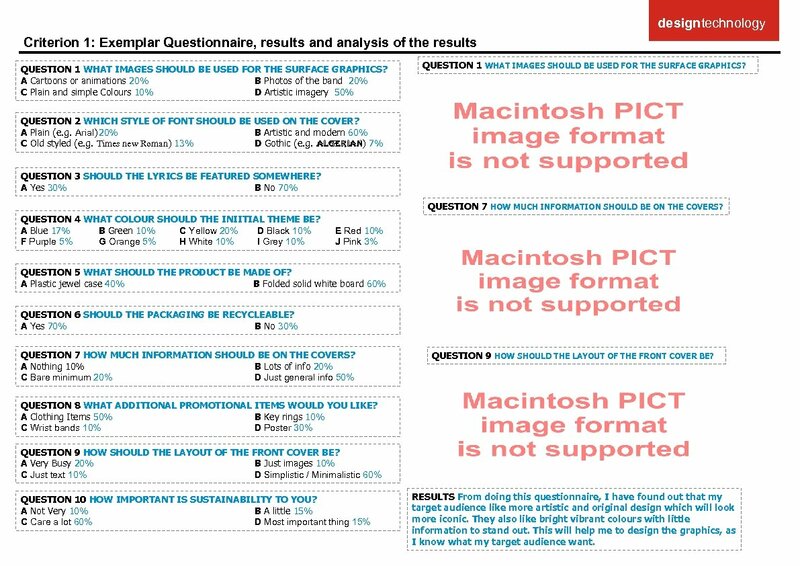 designtechnology Criterion 1: Exemplar Questionnaire, results and analysis of the results QUESTION 1 WHAT IMAGES SHOULD BE USED FOR THE SURFACE GRAPHICS? A Cartoons or animations 20% B Photos of the band 20% C Plain and simple Colours 10% D Artistic imagery 50% QUESTION 1 WHAT IMAGES SHOULD BE USED FOR THE SURFACE GRAPHICS? QUESTION 2 WHICH STYLE OF FONT SHOULD BE USED ON THE COVER? A Plain (e. g. Arial) 20% B Artistic and modern 60% C Old styled (e. g. Times new Roman) 13% D Gothic (e. g. algerian) 7% QUESTION 3 SHOULD THE LYRICS BE FEATURED SOMEWHERE? A Yes 30% B No 70% QUESTION 7 HOW MUCH INFORMATION SHOULD BE ON THE COVERS? QUESTION 4 WHAT COLOUR SHOULD THE INIITIAL THEME BE? A Blue 17% B Green 10% C Yellow 20% D Black 10% F Purple 5% G Orange 5% H White 10% I Grey 10% E Red 10% J Pink 3% QUESTION 5 WHAT SHOULD THE PRODUCT BE MADE OF? A Plastic jewel case 40% B Folded solid white board 60% QUESTION 6 SHOULD THE PACKAGING BE RECYCLEABLE? A Yes 70% B No 30% QUESTION 7 HOW MUCH INFORMATION SHOULD BE ON THE COVERS? A Nothing 10% B Lots of info 20% C Bare minimum 20% D Just general info 50% QUESTION 9 HOW SHOULD THE LAYOUT OF THE FRONT COVER BE? QUESTION 8 WHAT ADDITIONAL PROMOTIONAL ITEMS WOULD YOU LIKE? A Clothing Items 50% B Key rings 10% C Wrist bands 10% D Poster 30% QUESTION 9 HOW SHOULD THE LAYOUT OF THE FRONT COVER BE? 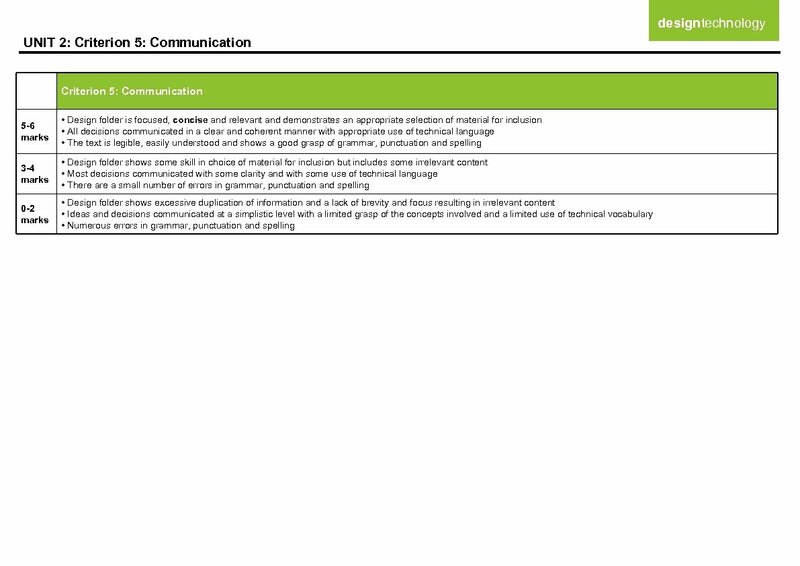 A Very Busy 20% B Just images 10% C Just text 10% D Simplistic / Minimalistic 60% QUESTION 10 HOW IMPORTANT IS SUSTAINABILITY TO YOU? A Not Very 10% B A little 15% C Care a lot 60% D Most important thing 15% RESULTS From doing this questionnaire, I have found out that my target audience like more artistic and original design which will look more iconic. They also like bright vibrant colours with little information to stand out. This will help me to design the graphics, as I know what my target audience want. 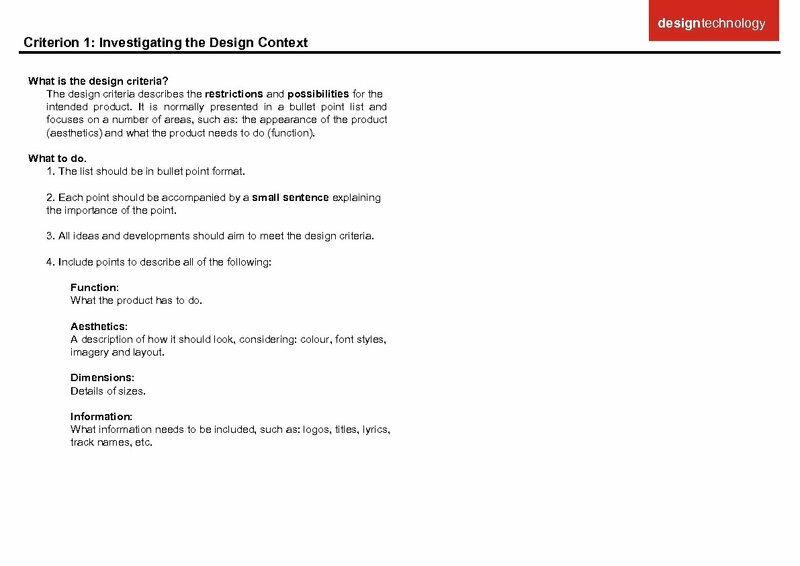 designtechnology Criterion 1: Investigating the Design Context What is the design criteria? 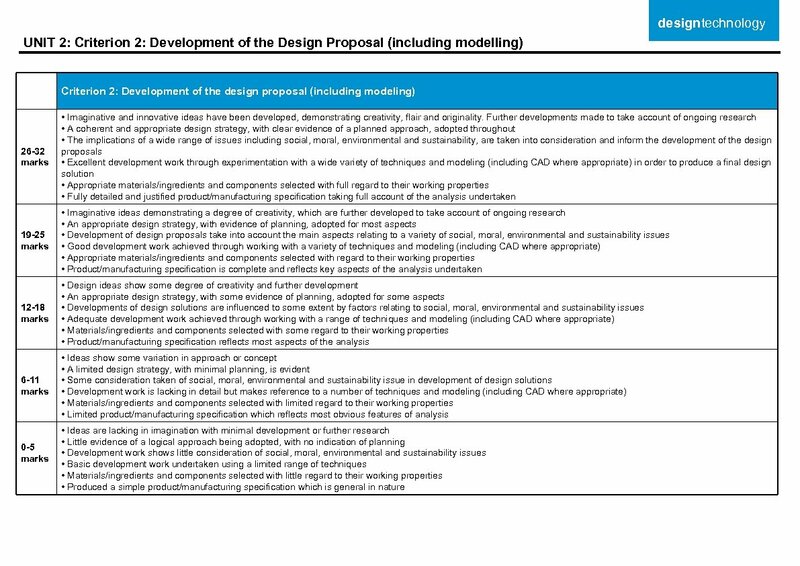 The design criteria describes the restrictions and possibilities for the intended product. It is normally presented in a bullet point list and focuses on a number of areas, such as: the appearance of the product (aesthetics) and what the product needs to do (function). What to do. 1. The list should be in bullet point format. 2. Each point should be accompanied by a small sentence explaining the importance of the point. 3. 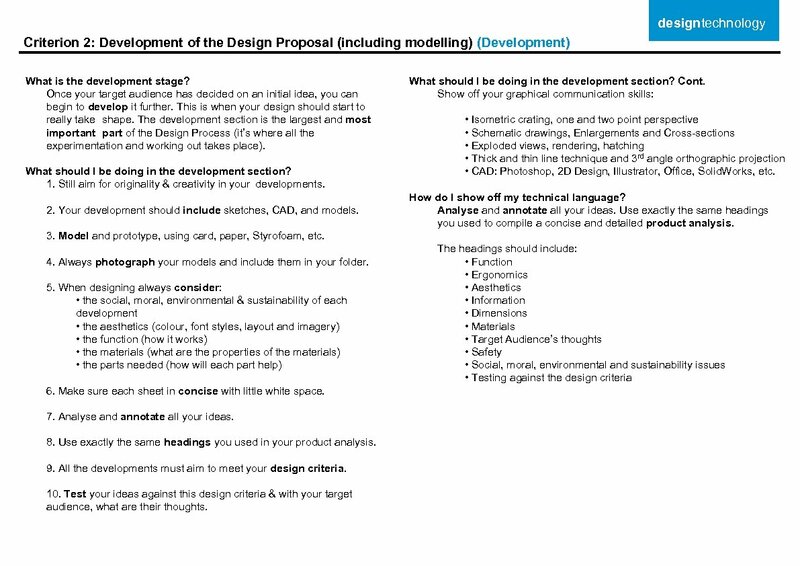 All ideas and developments should aim to meet the design criteria. 4. Include points to describe all of the following: Function: What the product has to do. Aesthetics: A description of how it should look, considering: colour, font styles, imagery and layout. Dimensions: Details of sizes. Information: What information needs to be included, such as: logos, titles, lyrics, track names, etc. 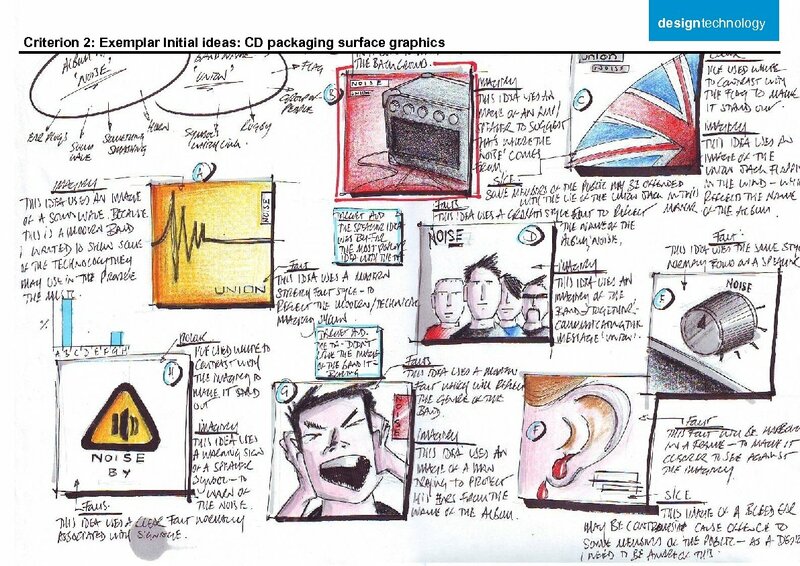 designtechnology Criterion 1: Exemplar Design criteria My CD case may meet the following points: Function Aesthetics It must be able to promote the band. This will increase the popularity of the band therefore increase sales. It must look artistic and modern. This is because the band is young so it must reflect the genre of the music. It must protect the CD. This stops the disc from being scratched or broken so it is able to play the media without fault. It must be easy to transport. This makes it easier and quicker for it to be transported, and it also makes it safer if the product can sit square. It must be able to promote the band. Therefore people will get to like them and want to buy again, or buy for the first time because the images look good. Dimensions Information It must be able to hold a CD. A It must include the name of CD has a diameter of 120 mm. the band. This is so the This is the main principle of the consumer is able to know who case. the album is by. Also it gives the album a Brand. The font style must be original It must comply to and modern. This is so theme manufacturing limitations. It must include a Barcode. is continued throughout the product. This is so that it is possible to This is so the product is able to make and that materials aren’t be purchased at a shop. The colours must be bright and wasted. vibrant. This is to keep within the It must show the track names. theme, and also to meet the target It must consider the hole at This is so the consumer is able to audience requirements. the centre of the CD. This is find which track they want easily. 14 mm in diameter and is key Also it gives each track its The imagery must be bold and because it cuts out part of the CD originality. iconic. This is so the product graphics. Also the centre which stands out and shows that the band remains transparent is 39 mm in It must include the record is different from other bands. diameter which will also cut away producers logo. This makes the from the graphics. product look professional. Also it The layout of the product shows that the product has be should be simplistic / It must have a geometric licensed and can be sold in shops. minimalistic. This is to make the shape. This is so it is easier for imagery stand out and to meet the transport and is less likely to be It should show if it needs target audience requirements. damaged in the process. Parental Advisory. This shows that the CD has explicit material. It must fit into a universal CD shelf / rack. This is so people can easily store it with other products. Materials It must include a smart material. This is to promote the band further by making it more interesting. The packaging must include a feature of sustainability. This is so the part of the product can be recycled so it isn’t wasting nonrenewable resources. The material must be able to meet all the requirements of it’s function and purpose. Such as being able to protect the CD from damage or it making the product easy to transport. 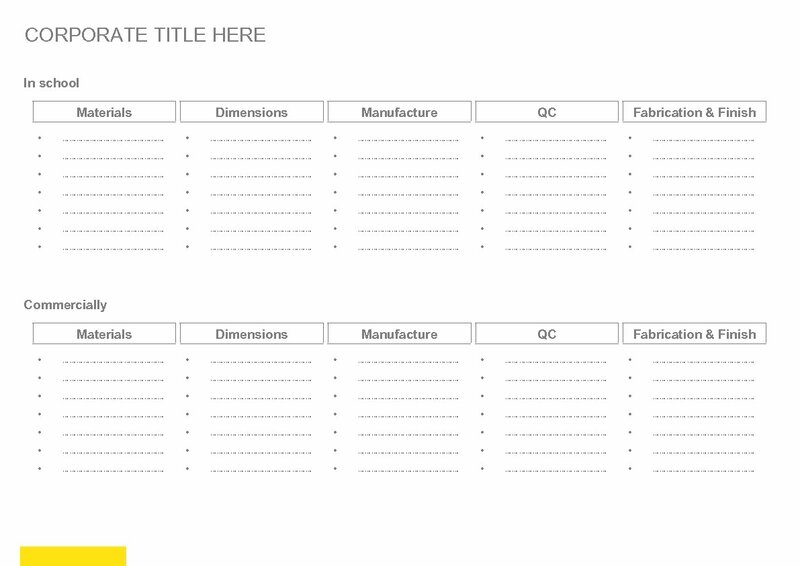 CORPORATE TITLE HERE: DESIGN CRITERIA My ? ? ? may meet the following points: Function Aesthetics Dimensions Information Point 1 Justifying sentence Point 2 Justifying sentence Point 3 Justifying sentence Point 4 Justifying sentence Point 5 Justifying sentence Point 6 Justifying sentence Etc. 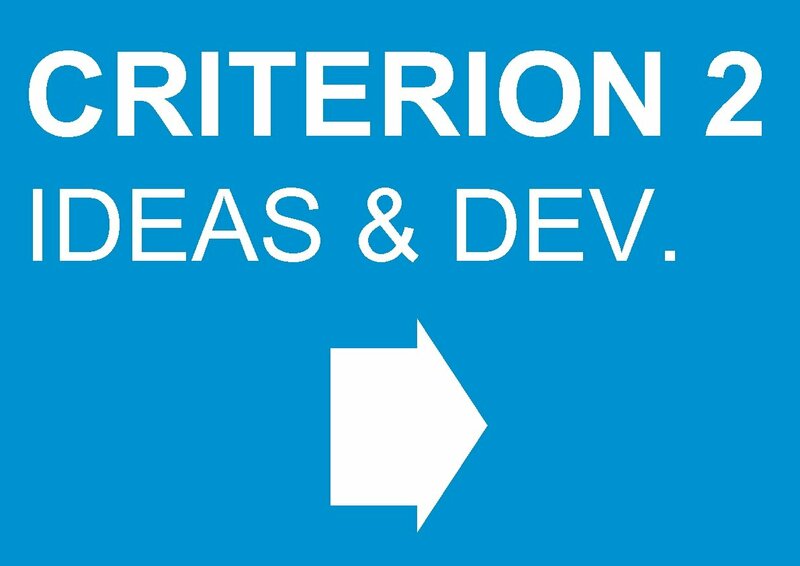 CRITERION 2 IDEAS & DEV. designtechnology Criterion 2: Development of the Design Proposal (including modelling) (Manufacturing Spec) What’s a product/ / manufacturing speciation? The manufacturing specification comes at the end of the development phase, but before you start making the final outcomes. 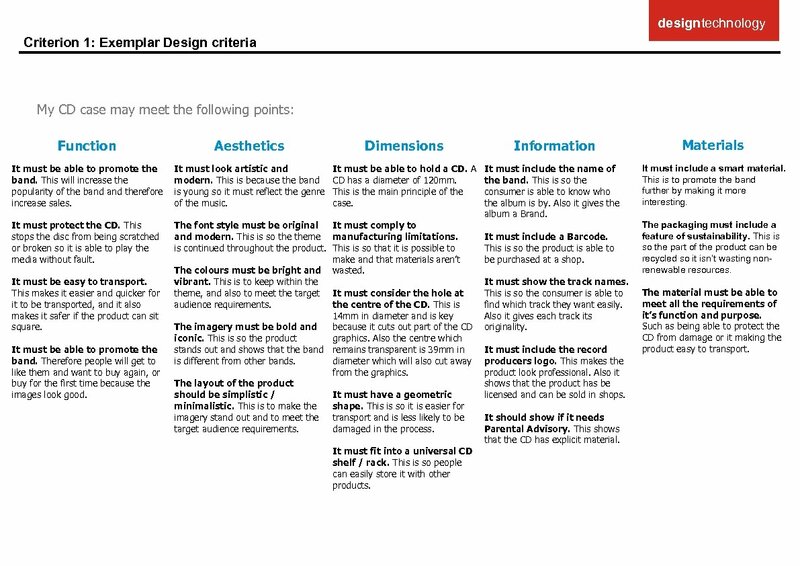 Like the ‘design criteria’, it should be presented in a series of bullet point statements and should explain exactly how to make the final product, hence the name ‘manufacturing specification’. 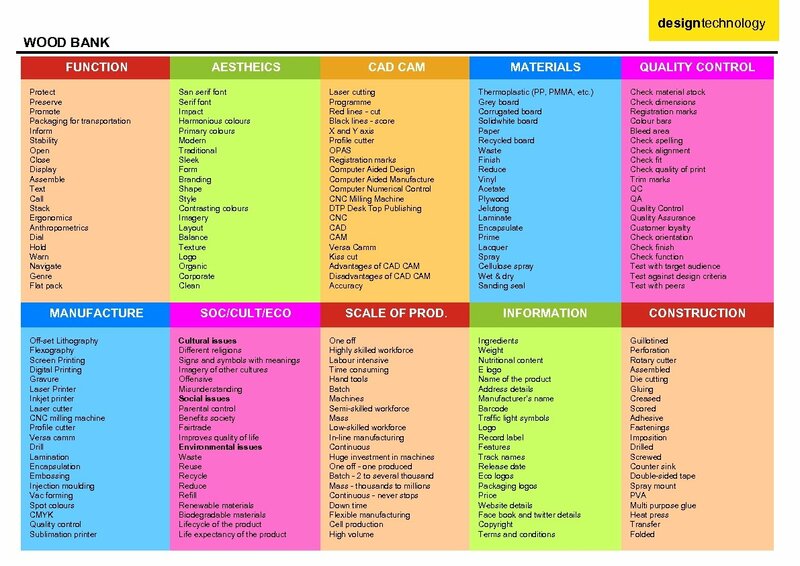 Include points to describe all of the following: Materials: what will each part be made from & how much material is needed? Dimensions: : precise measurements for each part in millimeters? Tolerances: the maximum and minimum size each part can be. Quality Control: what needs to be checked & how and when to check it. Construction: explain exactly how each part will be made. Cost: how much will each part cost and detail any other costs involved. designtechnology Criterion 2: Making Most of the marks for this section are achieved by making a 3 D outcome. You should be aiming to show a high level of making and modelling skills. For example: is the product folded correctly; do the edges line up; has it been neatly cut; does it fit together and are there any gaps? However, some of the marks for this section can be picked up in your portfolio. How can I pickup marks for making in my portfolio? 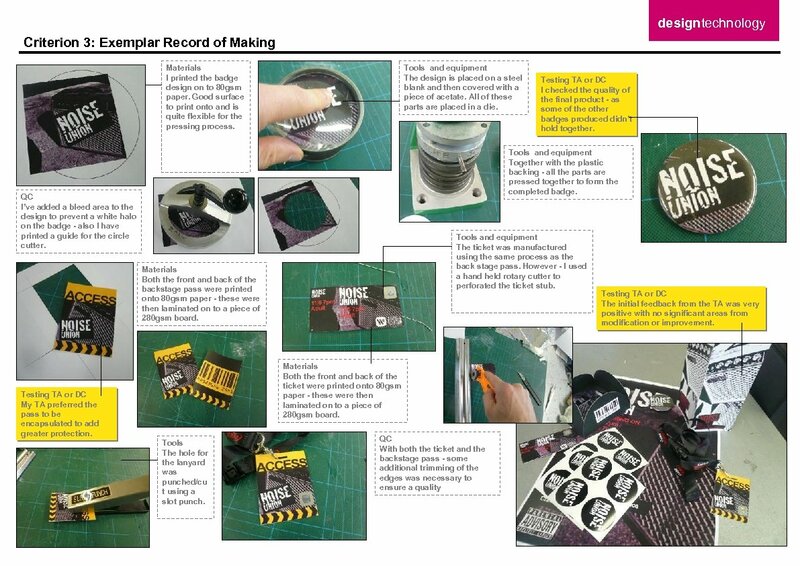 Record the making process using photographs and annotations. For example: What tools have you used and why? Craft knife, safety rule, slot punch, etc. Which materials have you used and why? Able to print on to it, rigid, flexible or can be easily cut. What technologies have you used and why? Laser cutter, OPAS, milling machine, 3 D Printer (Very important – you must explain the process of using them) How do I build Quality Control checks into my making? Nearly all products produced on a commercial level will need checks in place to ensure a quality product is produced every time. Refer to the next two slides for guidance. Help? You are awarded marks for working independently and how you have solved designing and manufacturing problems. Think about what you have done in year 10 and in year 9. Finally Does the final product look professional and is it suitable for the target audience (how do you know have you asked them)? 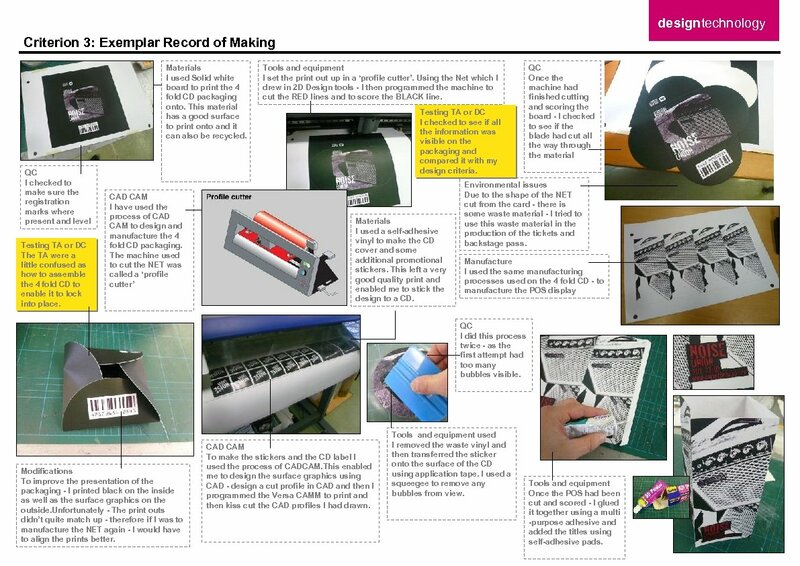 designtechnology Criterion 3: Exemplar Record of Making Materials I printed the badge design on to 80 gsm paper. Good surface to print onto and is quite flexible for the pressing process. Tools and equipment The design is placed on a steel blank and then covered with a piece of acetate. All of these parts are placed in a die. Testing TA or DC I checked the quality of the final product - as some of the other badges produced didn’t hold together. Tools and equipment Together with the plastic backing - all the parts are pressed together to form the completed badge. QC I’ve added a bleed area to the design to prevent a white halo on the badge - also I have printed a guide for the circle cutter. Tools and equipment The ticket was manufactured using the same process as the back stage pass. However - I used a hand held rotary cutter to perforated the ticket stub. Materials Both the front and back of the backstage pass were printed onto 80 gsm paper - these were then laminated on to a piece of 280 gsm board. Materials Both the front and back of the ticket were printed onto 80 gsm paper - these were then laminated on to a piece of 280 gsm board. Testing TA or DC My TA preferred the pass to be encapsulated to add greater protection. Tools The hole for the lanyard was punched/cu t using a slot punch. QC With both the ticket and the backstage pass - some additional trimming of the edges was necessary to ensure a quality Testing TA or DC The initial feedback from the TA was very positive with no significant areas from modification or improvement. 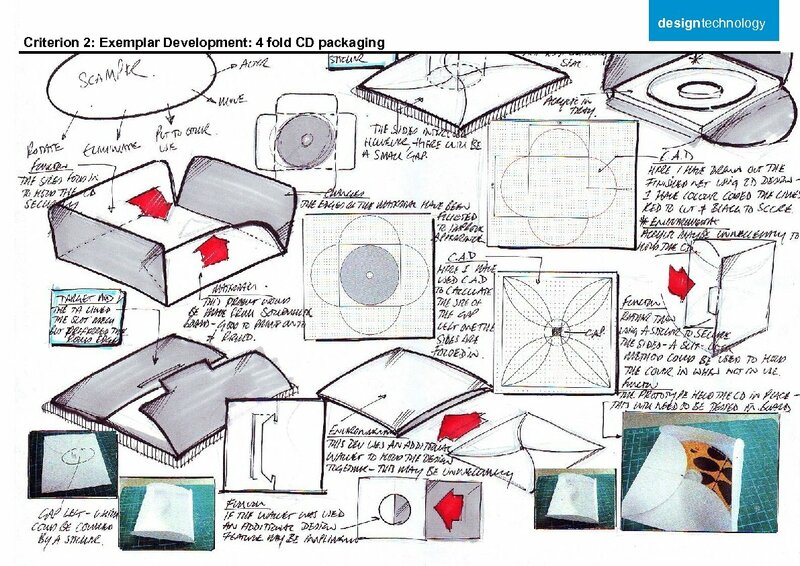 designtechnology Criterion 3: Exemplar Record of Making Materials I used Solid white board to print the 4 fold CD packaging onto. This material has a good surface to print onto and it can also be recycled. QC I checked to make sure the registration marks where present and level Testing TA or DC The TA were a little confused as how to assemble the 4 fold CD to enable it to lock into place. CAD CAM I have used the process of CAD CAM to design and manufacture the 4 fold CD packaging. The machine used to cut the NET was called a ‘profile cutter’ Tools and equipment I set the print out up in a ‘profile cutter’. Using the Net which I drew in 2 D Design tools - I then programmed the machine to cut the RED lines and to score the BLACK line. Testing TA or DC I checked to see if all the information was visible on the packaging and compared it with my design criteria. Materials I used a self-adhesive vinyl to make the CD cover and some additional promotional stickers. This left a very good quality print and enabled me to stick the design to a CD. QC Once the machine had finished cutting and scoring the board - I checked to see if the blade had cut all the way through the material Environmental issues Due to the shape of the NET cut from the card - there is some waste material - I tried to use this waste material in the production of the tickets and backstage pass. Manufacture I used the same manufacturing processes used on the 4 fold CD - to manufacture the POS display QC I did this process twice - as the first attempt had too many bubbles visible. Modifications To improve the presentation of the packaging - I printed black on the inside as well as the surface graphics on the outside. Unfortunately - The print outs didn’t quite match up - therefore if I was to manufacture the NET again - I would have to align the prints better. CAD CAM To make the stickers and the CD label I used the process of CADCAM. This enabled me to design the surface graphics using CAD - design a cut profile in CAD and then I programmed the Versa CAMM to print and then kiss cut the CAD profiles I had drawn. Tools and equipment used I removed the waste vinyl and then transferred the sticker onto the surface of the CD using application tape. I used a squeegee to remove any bubbles from view. Tools and equipment Once the POS had been cut and scored - I glued it together using a multi -purpose adhesive and added the titles using self-adhesive pads. designtechnology Criterion 2: Making (Quality Assurance and Quality Control - 1) What is QA (Quality Assurance)? Companies have long realised that cost is not the only influencing factor for manufacturer and consumer choice. Factors such as: build quality, consumer service, performance and quality of design dictate why one product is chosen over another. The term ‘Quality Assurance’ relates to all aspects of the manufacturing process, from the early stages of design right through to the delivery of the product. What is QC (Quality Control)? Quality Control is a small part of Quality Assurance. It involves a series of checks, which take place on a product during the manufacturing process. The checks are carried out to ensure that each product meets the required standards. These checks are a crucial part of the manufacturing process and can take place at anytime. Possible checks may include: 1. 2. 3. 4. Checking the size of the product or component Checking for spelling mistakes Checking the consistency of the colour Checking the registration of the colours. How can I show that I’ve considered QA and QC in my project? 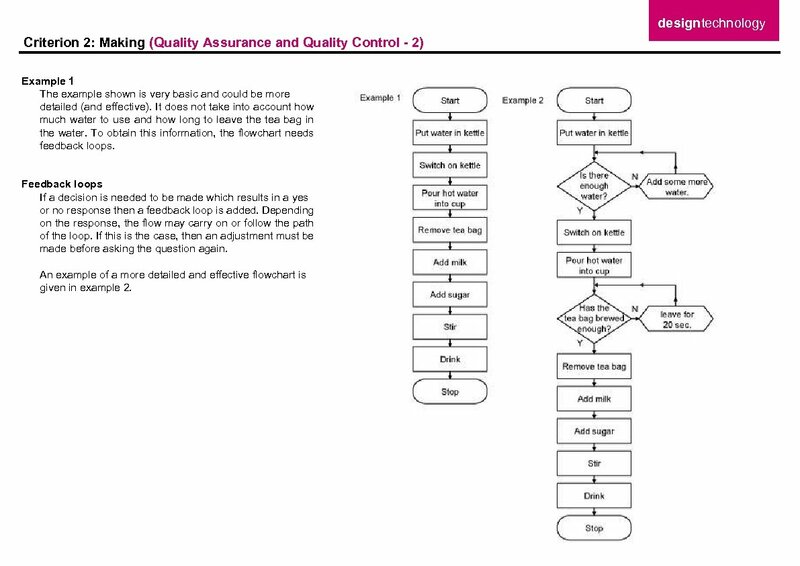 One method of showing QA would be to design a flowchart building in quality control checks throughout the manufacturing stages. What is a flowchart and why use them? 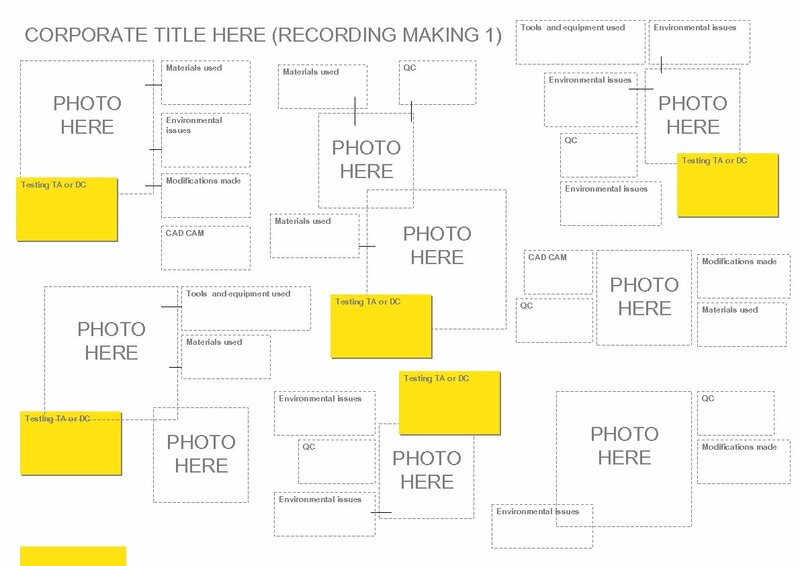 Flowcharts allow us to present a sequence of activities in a clear and informative manner; such as the manufacturing of a product to ensure quality control checks are made. Like many forms of communication, a need for standardisation is required in order for others to interpret the information. Flowcharts use a series of shapes to help communicate the information. Standardisation in flowcharts The lozenge shape illustrates the start & finish of the flowchart. The rectangle contains a process or task. The diamond shape represents a decision to be made. The parallelogram represents a point of input or a point of output. This shape represents a point of adjustment. 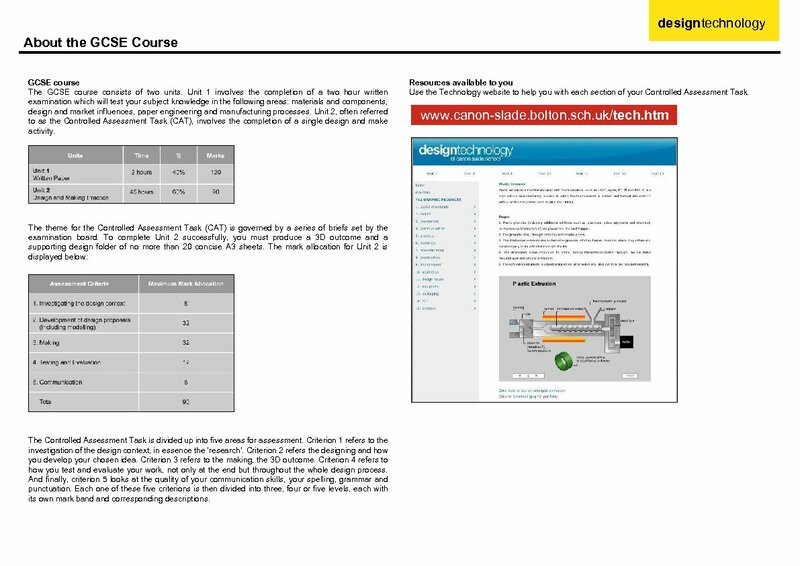 designtechnology Criterion 2: Making (Quality Assurance and Quality Control - 2) Example 1 The example shown is very basic and could be more detailed (and effective). It does not take into account how much water to use and how long to leave the tea bag in the water. To obtain this information, the flowchart needs feedback loops. Feedback loops If a decision is needed to be made which results in a yes or no response then a feedback loop is added. Depending on the response, the flow may carry on or follow the path of the loop. If this is the case, then an adjustment must be made before asking the question again. 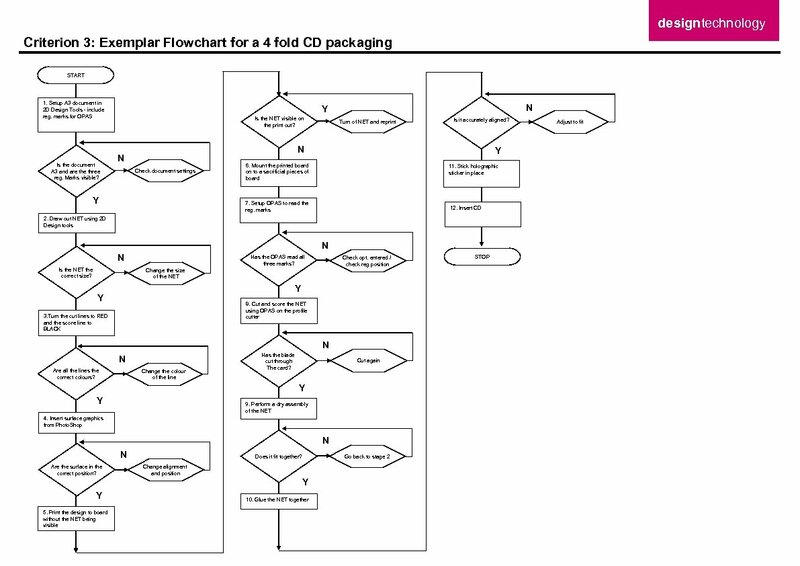 An example of a more detailed and effective flowchart is given in example 2. 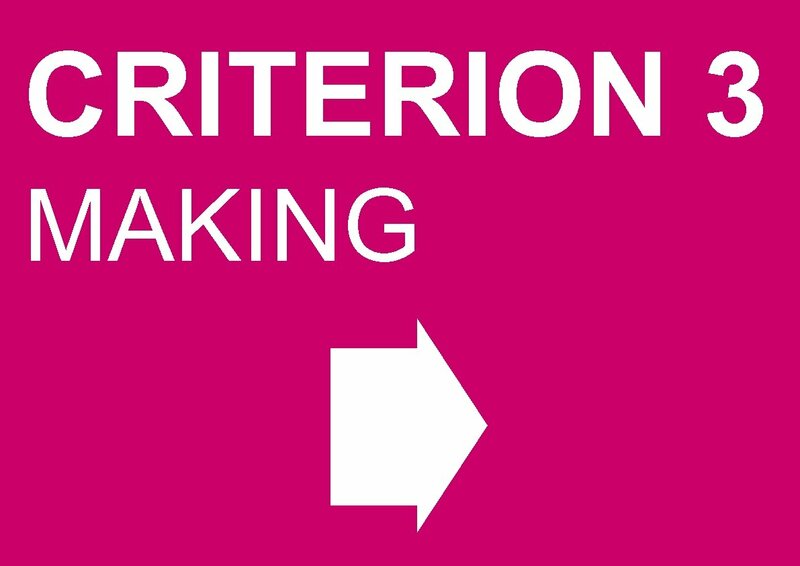 CRITERION 4 EVAL. & TEST. 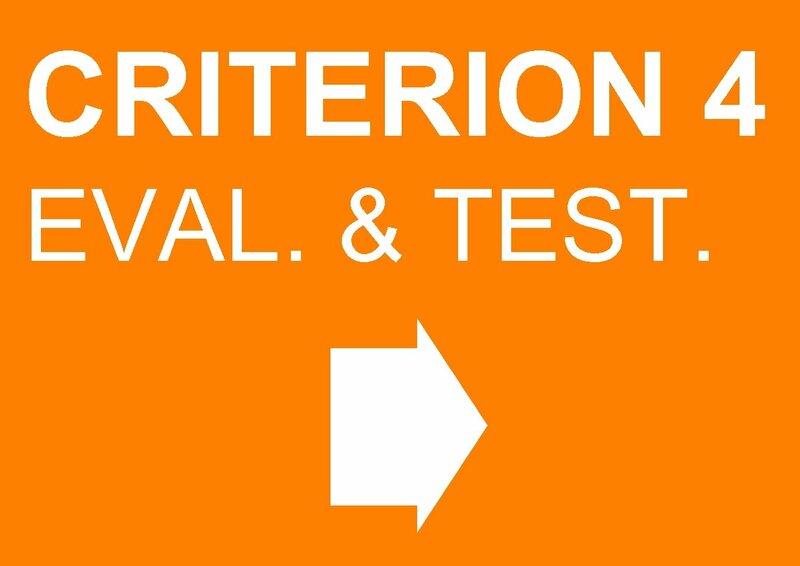 designtechnology Criterion 4: Testing and evaluating (Summative and Formative) Testing The testing procedure is an essential part of the design process. All products will have to undergo many tests before they are manufactured and released onto the market. We can break the testing procedure into two areas: physical testing and consumer testing (or asking the target audience), both should occur throughout the design process. Physical testing A physical test would be carried out to ensure the product is fit for purpose, meeting all the points listed on in the design criteria and the manufacturing specification. 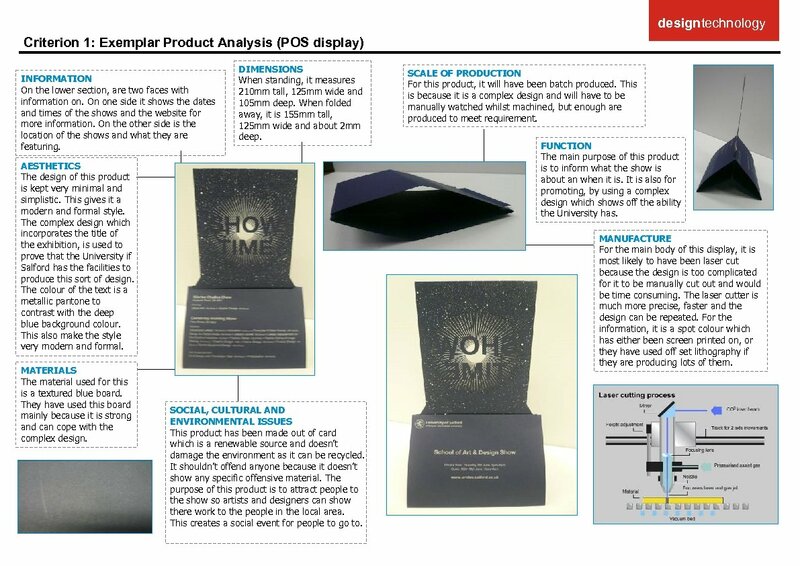 For example, a POS Display will have to be tested to ensure: • it has good stability; • it can be disassembled for postage; • it is strong and rigid. Consumer testing It is also important to gather opinions from the product’s intended users (the target audience). In industry, consumer tests are carried out on a selection of the target audience to obtain essential opinions. These tests normally involve a questionnaire or a simple ranking test. Consumers are asked if the product meets their needs and why. This helps the design team to improve the product’s function and aesthetics. 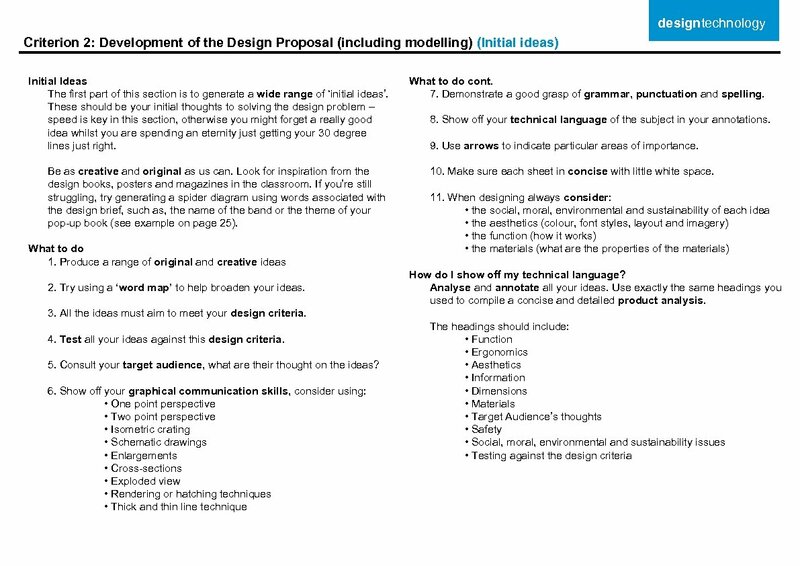 How do I test and evaluate my ideas and artefacts? 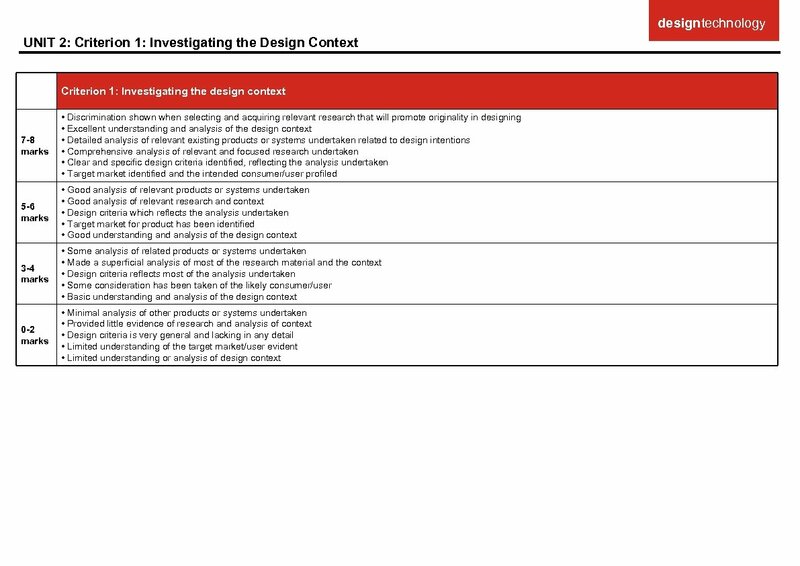 Evaluating is the process of critically and objectively questioning how well the design ideas or the final product meets the design criteria or the manufacturing specification. Testing and evaluating IS NOT a section which simply occurs at the end of the design process. 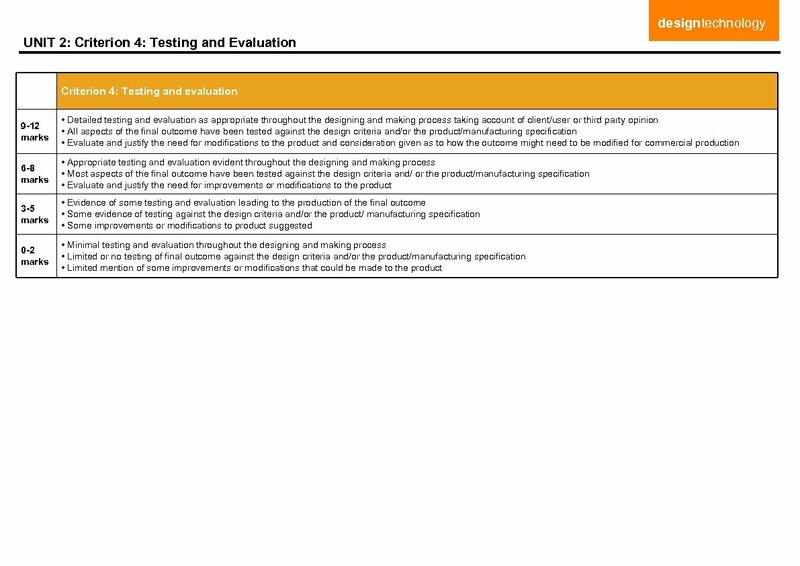 Good testing and evaluating should appear at various stages throughout the design folder. We can break the evaluation process into two areas: formative testing and evaluating and summative testing and evaluating. Formative testing and evaluating Formative evaluating forms throughout the design process. 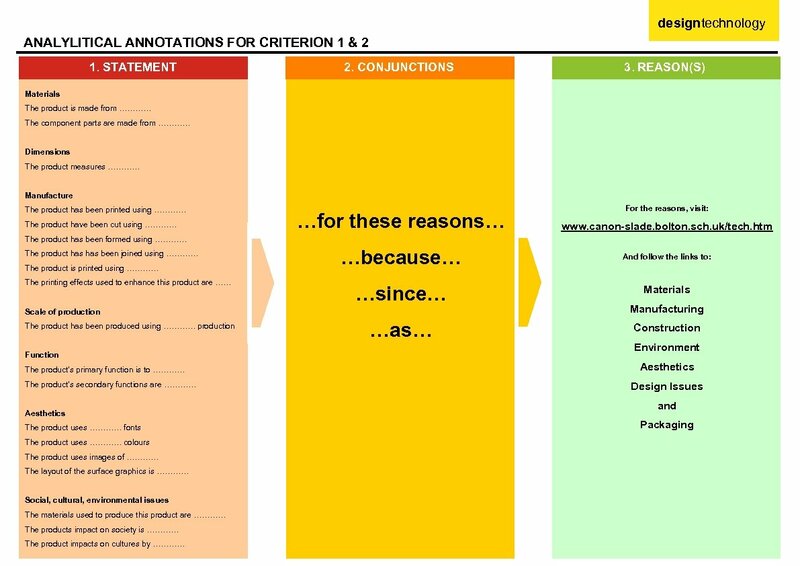 Every time you make a decision or judgement about your work it should be in relation to the contents of your design criteria, manufacturing specification or your target audience's thoughts. 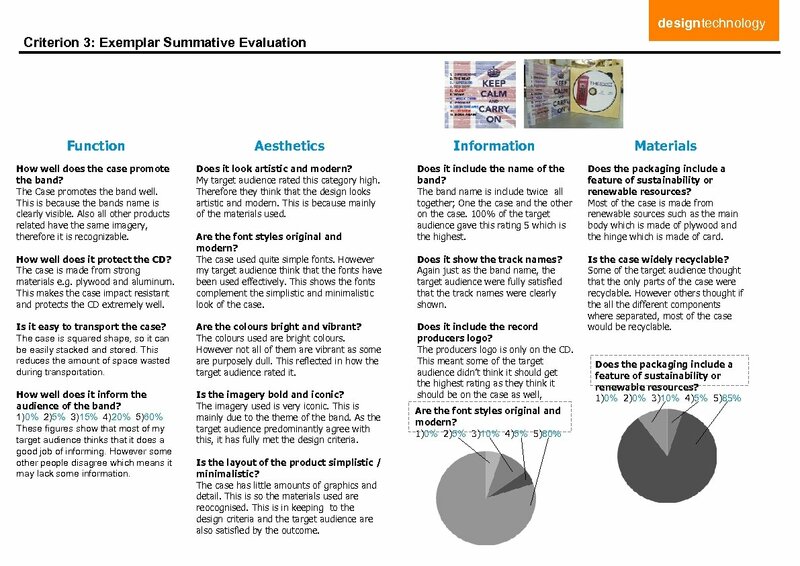 Summative testing and evaluating Summative evaluating occurs at the end of the design process (summarising). It specifically judges how well the final product meets the design criteria or the manufacturing specification. For a detailed summative evaluation: • always write in third person (Don’t write: I think or I like); • always include sketches detailing how to impove the product; • answer every point listed in the design criteria or manufacturing specification; • always include the opinion of a third party - ideally the client or someone from the target audience; • compile a questionnaire to ask your target audience; • use photographs to support and describe aspects of the product; • refer to your modifications list to help explain why aspects of the product were changed. 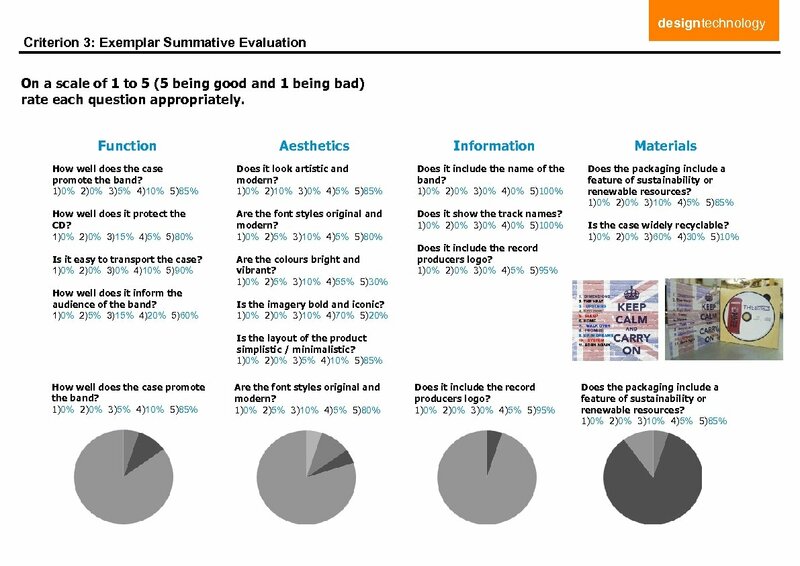 Evaluating how the product could be manufactured in industry At the end of the summative evaluation, consider how the product could be made (manufactured) on an industrial scale. Clearly their would need to be some modifications in order of this to occur. Simply, list these modifications and then comment how it would be produced commercially. For example: Which method of commercial printing would be used and why; how would the product be constructed commercially or which plastic manufacturing method would be used to produce the product and why.